Welcome to the Cafe at the New Room! A visit to the New Room is not complete without sampling a drink or a snack from our cafe. Cafe manager Ewa, assistant cafe manager Niamh and their team offer a delicious range of drinks, cakes and light lunches as well as afternoon teas and daily specials. There is a commitment to using Fairtrade and organic coffee and tea and other items. The coffee is particular has a good pedigree - and it's called Grumpy Mule! Look out for the famous chocolate brownies (as sampled by HRH The Duke of Gloucester!) and the delicious shortbread and pecan pie. The café caters for vegan, vegetarian and gluten-free diets, and carnivores can be reassured to know that the meat is locally sourced from MJ Dalton’s butchers on Gloucester Road. Ewa is committed to using local firms and suppliers. Most of the food sold in the 40-seater café is produced in-house, with the exception of the gluten-free range, plus the bread, which is provided by Hobbs House Bakery. You are assured of a friendly welcome and a pleasant time sitting in the courtyard, which is protected from the elements by a glass roof. The cafe is open from 9.30am-4pm Monday to Saturday. If you would like to reserve a table for lunch or an afternoon tea please email Ewa via cafe@newroombristol.org.uk or ring us on 0117 926 4740. If you would like to hire a room and order a working lunch for your meeting then please do contact us using the same contact details. 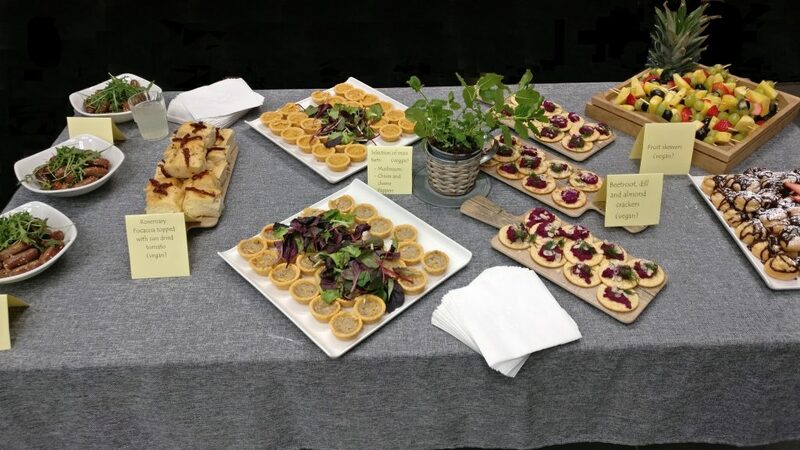 We also cater for events big and small, offering bespoke menus to suit your event and budget. Canapes and mocktails, light lunches and homemade treats; our award-winning cafe team are always happy to help, and we hope to welcome you soon.